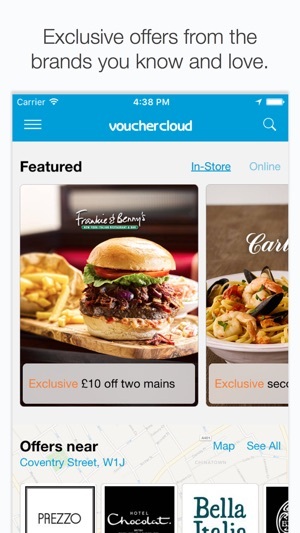 Get the best savings and offers for your favourite restaurants, high-street stores, supermarkets and brands straight to your phone with the award winning free vouchercloud app. 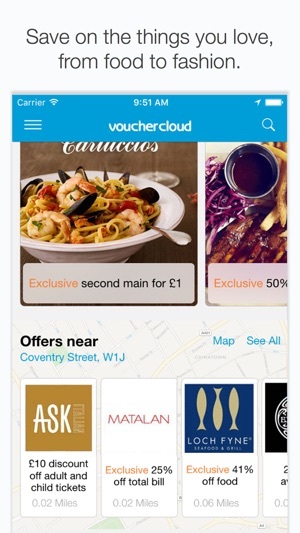 vouchercloud lets you search for the best savings near you and delivers money-saving vouchers that you can use at restaurants, high-street shops, days out, leisure, entertainment and much more. There's also a huge range of online shopping vouchers and codes so you can save on anything from the latest tech gadgets to the current fashion must haves as well as your weekly shop. 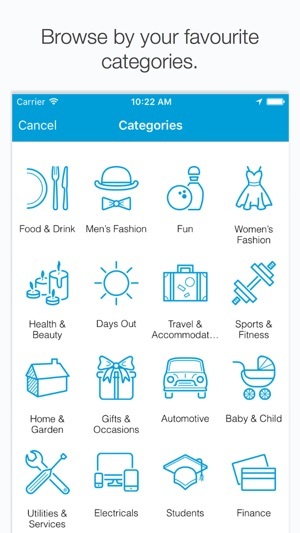 Used by more than six million customers across the globe, featured as a Top lifestyle App and rated as one of the best 500 apps in the world by The Sunday Times, we’ve saved our customers millions since we launched in 2010.
vouchercloud brings you fantastic discounts from the best local restaurants in town. Get money off offers and discount deals from great Italian restaurants like Pizza Express, ASK, Strada and Bella Italia or if you fancy something different get pizza vouchers for Pizza Hut, 25% off Frankie & Benny's, a BOGOF deal at Fayre & Square or go for super Spanish savings at La Tasca. At vouchercloud we don't just find you discounts for going out, we'll help you look amazing when you do go out. Get in-store and online fashion vouchers for men and women's fashion from top clothing and jewellery brands such as Nike, Jack Wills, New Look, asos, Sports Direct, Hinds, Marks and Spencer, John Lewis, Bonmarché, Sports Direct, Next and Ted Baker. 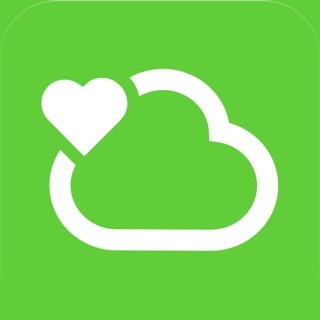 vouchercloud helps you find the best local offers near and around you. We focus on getting you the best possible deal at the right discounted price and we make sure you get them from top quality brands and outlets. We have searched high and low for the best travel deals. Using our free voucher app will help you get Exclusive coupons from Purple Parking so you don't have to spend a fortune when you park up to go on holiday. What's more, you can also get Thomas Cook coupons as well as First Choice holiday offers. We've got money vouchers at Disney World and hotel bargains from Riu Hotel & Resorts, QHotels and Travelodge. Getting great deals isn’t all about fashion, tech and travel, we have exclusive passes to Now TV, Microsoft Office deals, free Sky broadband, trainline, The National Trust, livingsocial, Amazon and Virgin Wines. Browse through our categories to get all the latest discount vouchers. 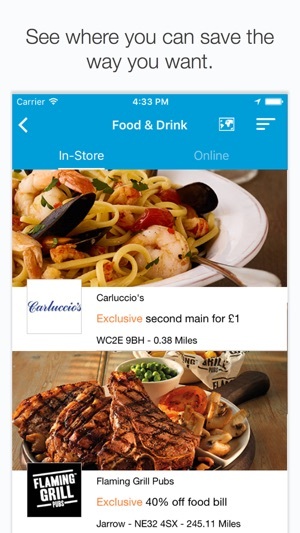 vouchercloud is the No.1 money saving platform, delivering savings every day from your favourite brands. 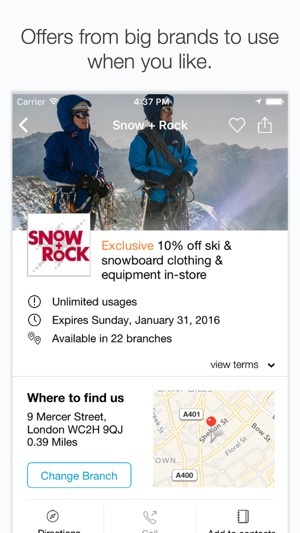 Our website and FREE app have the most amount of vouchers and offers available in over 18 different countries. Can't believe this is free! This app started years ago and I thought it would burn out shortly afterwards. It's done the opposite and gone from strength to strength! Yesterday it saved me £14 in Zizzi completely unexpectedly, and has saved me lots in the past, but I haven't had to pay the developers a penny for it. Thank you, guys! Great app! Used it a few times at various places and it works great. Would be perfect if I could browse vouchers, add any I like to Apple Wallet and when I need them I can just bring up Apple Wallet in a couple of seconds.